From the Departments of Psychiatry (E.M.K., S.H.K., J.C.K., A.L., S.G., J.W.S. ), Neurology (E.M.K., S.H.K., J.C.K., A.L., M.E., S.G., J.W.S. ), and Pediatrics (M.E. ), and Alzheimer's Disease Research Center (E.M.K., S.H.K., J.C.K., A.L., M.E., S.G., J.W.S. ), Icahn School of Medicine at Mount Sinai, New York, NY; Department of Molecular Biology and Biochemistry (A.H., R.A., C.G.G. ), University of California at Irvine; King Fahd Medical Research Center (A.H., R.A., C.G.G. ), KAU, Jeddah, Saudi Arabia; Department of Biochemistry (A.S.), Faculty of Medicine, Graduate School of Medicine & Pharmaceutical Sciences, University of Toyama, Japan; Center for Neural Science (C.M.A. ), New York University, NY; Northwestern University (W.L.K. ), Chicago, IL; Department of Neurology and Brain Mind Research Institute (P.S., N.R.R. ), Weill Cornell Medical College, New York, NY; Biochemistry Department (C.G.G. ), Faculty of Science and Experimental Biochemistry Unit, King Fahd Medical Research Center, King Abdulaziz University, Jeddah, Saudi Arabia; James J. Peters VA Medical Center (S.G.), Bronx, NY; and Sanford Consortium for Regenerative Medicine (J.W.S. ), University of California San Diego, La Jolla, CA. Background: Recent studies have implicated specific assembly subtypes of β-amyloid (Aβ) peptide, specifically soluble oligomers (soAβ) as disease-relevant structures that may underlie memory loss in Alzheimer disease. Removing existing soluble and insoluble Aβ assemblies is thought to be essential for any attempt at stabilizing brain function and slowing cognitive decline in Alzheimer disease. IV immunoglobulin (IVIg) therapies have been shown to contain naturally occurring polyclonal antibodies that recognize conformational neoepitopes of soluble or insoluble Aβ assemblies including soAβ. These naturally occurring polyclonal antibodies have been suggested to underlie the apparent clinical benefits of IVIg. However, direct evidence linking anti-Aβ antibodies to the clinical bioactivity of IVIg has been lacking. Methods: Five-month-old female Dutch APP E693Q mice were treated for 3 months with neat IVIg or with IVIg that had been affinity-depleted over immobilized Aβ conformers in 1 of 2 assembly states. Memory was assessed in a battery of tests followed by quantification of brain soAβ levels using standard anti-soAβ antibodies. Results: We provide evidence that NU4-type soAβ (NU4-soAβ) assemblies accumulate in the brains of Dutch APP E693Q mice and are associated with defects in memory, even in the absence of insoluble Aβ plaques. Memory benefits were associated with depletion from APP E693Q mouse brain of NU4-soAβ and A11-soAβ but not OC-type fibrillar Aβ oligomers. Conclusions: We propose that targeting of specific soAβ assembly subtypes may be an important consideration in the therapeutic and/or prophylactic benefit of anti-Aβ antibody drugs. Immune Globulin (IG), an IVIg therapy developed by Baxter Pharmaceuticals, has shown benefit in AD models8,9 and produced cognitive benefit in early trials.10,11 IG contains nAbs that recognize conformational neoepitopes on detergent-soluble and -insoluble Aβ aggregates. However, direct evidence linking anti-Aβ antibodies to the clinical bioactivity of IG has been lacking. The aim of this study was to test the effects of neat or Aβ-affinity-depleted forms of IG on learning behaviors and pathology in Dutch APP E693Q12 transgenic mice, and to determine whether improved learning behavior(s) might be associated with the depletion of specific soluble oligomeric Aβ (soAβ) immunosubtypes. Animal procedures were conducted in accordance with the NIH Guidelines for the Care and Use of Experimental Animals and were approved by the Institutional Animal Care and Use Committee at the Icahn School of Medicine at Mount Sinai. All mice were given ad libitum access to food and water, and housed in micro-isolator cages under a 12-hour light/dark cycle. Generation of Dutch (APP E693Q) and PS1ΔE9 transgenic mouse lines have been described previously.12 For baseline cued and contextual fear conditioning (FC) behavior, experimentally naive, 6-month-old male and female mice were used: nontransgenic (nTg; n = 8), Dutch (n = 9), and Dutch/PS1ΔE9 (n = 13). For IG drug-treatment experiments, 5-month-old female Dutch APP E693Q transgenic mice were given weekly subcutaneous injections of either saline (n = 11) or 2 g/kg neat Baxter IG (n = 12), 2 g/kg IG depleted of anti-fibril Aβ antibodies (fibril Aβ-affinity-depleted IG; n = 11), 2 g/kg IG depleted of anti-oligomer Aβ antibodies (oligomer Aβ-affinity-depleted IG; n = 11), or 2 g/kg IG depleted of both anti-oligomer and anti-fibril Aβ antibodies (Aβ-affinity-depleted IG; n = 11) for 3 months. Preparation of Aβ monomers, oligomers, and fibrils for affinity depletion. Depletion of anti-Aβ antibodies from Baxter IG by affinity chromatography. Resins for the depletion of anti-Aβ oligomer and anti-Aβ fibril antibodies were prepared as described.16 Baxter IG at 10 mg/mL in PBS was passed at least 5 times over columns at 1 to 2 mL/min to deplete either anti-oligomer or anti-fibril antibodies. To produce IG deficient in antibodies against all types of amyloid, the columns, including monomer amyloid columns, were run in series. Unbound IG from the various columns was concentrated to approximately 500 mg/mL by ultrafiltration through 30k molecular weight cutoff filters (Sartorius Stedim) and dialyzed against PBS before use in the animal studies. For a list of antibodies used in the current study, or for immunofluorescence and immunohistology, Western blot, dot blot, and ELISA assays described here, see e-Methods at Neurology.org/nn. Independent-samples t tests were used to determine significant differences between 2 groups. One-way analyses of variance with Bonferroni post hoc analyses were used to compare 3 or more groups. Significance for t tests and analyses of variance are reported with a p ≤ 0.05 using 2-tailed tests with an α level of 0.05. All statistical analyses were performed using GraphPad Prism 5 (GraphPad Software, La Jolla, CA). Impairment of hippocampus-dependent memory is evident at 6 months of age in Dutch and Dutch APP/PS1ΔE9 mice. Six-month-old nTg, Dutch APP, and Dutch APP/PS1ΔE9 mice were trained and tested on the cued and contextual FC paradigm. By comparison to their nTg littermates, both Dutch APP and Dutch APP/PS1ΔE9 mice displayed significant impairment of contextual fear memory, whereas no differences were observed among the 3 groups for cued fear memory (figure 1, A and B). No significant differences were observed between male and female mice for performance on cued or contextual FC tasks (data not shown), consistent with our prior observations using the Morris water maze task12; therefore, males and females were combined for analysis. Because both contextual and cued fear memory rely on an intact amygdala,20 but only contextual memory relies additionally on an intact hippocampus, our data suggest that impaired contextual memory reflects a defect in hippocampus-dependent memory. This finding is consistent with prior studies of AD mouse models12,19,20 and patients with AD.21 No difference was observed between Dutch APP and Dutch/PS1ΔE9 mice for contextual memory, suggesting that the cause of cognitive defect may be common (i.e., related to APP E693Q transgene product) among the 2 mouse lines and not related to the accumulation of amyloid plaques that occurs only in Dutch/PS1ΔE9 mice. Six-month-old mice were trained and tested for contextual (A) and cued (B) fear memory. Brain lysates were analyzed for levels of soAβ (C), soluble Aβ42/40 (D), and insoluble aggregated Aβ42 (E). Using conformation-specific antibodies, levels of soluble prefibrillar (F) or fibrillar (G) oAβ were analyzed from brain lysates. (H) Brain sections were stained for soluble prefibrillar oAβ assemblies (A11) or nuclear oligomeric assemblies (M78); scale bars = 40 µm; ×20 magnification, counterstain is DAPI. Data are representative littermates; histograms represent mean ± SEM; *p < 0.05; **p < 0.01; ***p < 0.001. Aβ = β-amyloid; Agg. = aggregated; AU = arbitrary units; DAPI = 4',6-diamidino-2-phenylindole; nTg = nontransgenic; oAβ = oligomeric β-amyloid; soAβ = soluble oligomeric β-amyloid. Accumulation of soluble, but not insoluble, oligomeric Aβ assemblies is a common feature among Dutch APP and Dutch APP/PS1ΔE9 mice. Using a 7n22/7n22 duplicate-epitope sandwich immunoassay, we measured levels of total soAβ assemblies from both mouse lines. No differences were observed between Dutch APP and Dutch APP/PS1ΔE9 littermates for levels of soAβ assemblies (figure 1C). Next, we measured levels of soluble Aβ40 and Aβ42, revealing a significant difference between Dutch APP and Dutch APP/PS1ΔE9 mice for Aβ42/Aβ40 ratio (figure 1D), which is consistent with expression of the PS1ΔE9 transgene.12,22 We also observed a nearly 10-fold-higher accumulation of detergent-insoluble aggregated Aβ42 in the brains of Dutch APP/PS1ΔE9 mice as compared to their Dutch APP littermates (figure 1E). Based on the observation that both mouse lines accumulate the same amount of soAβ assemblies (figure 1C), we utilized conformation-specific antibodies to assess the native conformation of the soAβ assemblies. We noted a significant decrease in levels of A11-immunoreactive soluble prefibrillar oAβ assemblies among Dutch APP/PS1ΔE9 mice when compared to their Dutch APP littermates (figure 1, F and H), whereas no difference was observed between the 2 genotypes for levels of OC-immunoreactive soluble fibrillar oAβ assemblies (figure 1G). Previously, we reported marked intraneuronal accumulation of APP/Aβ in the brains of both Dutch APP and Dutch APP/PS1ΔE9 mice.12 We further characterized this pathology, revealing subtle differences in intra- and extraneuronal pathology between the genotypes (figure 2). Whereas Dutch APP mice primarily exhibited perinuclear intracellular 4G8-immunoreactivity without plaque-like M31-immunoreactivity, Dutch APP/PS1ΔE9 mice exhibited punctate intracellular 4G8-immunoreactivity and plaque-like M31-immunoreactivity (figure 2). Brains were stained to analyze intracellular accumulation of APP/Aβ (4G8) or extracellular accumulation of Aβ (mOC31). Punctate immunoreactivity to 4G8 was typically observed in Dutch APP/PS1ΔE9 mice, whereas Dutch APP mouse brains typically exhibited perinuclear immunoreactivity. Only Dutch APP/PS1ΔE9 mice accumulated insoluble mOC31-immunoreactive extracellular plaques. Micrographs are representative littermates; scale bars = 10 µm; ×20 magnification. Aβ = β-amyloid. We analyzed brain lysates from nTg, Dutch APP, and Dutch APP/PS1ΔE9 for markers of autophagic/lysosomal stasis including LC3, p62, α-synuclein, and APP in order to determine whether autophagic/lysosomal failure was evident and/or associated with accumulation of soAβ assemblies or insoluble Aβ42. No accumulation of soluble LC3, p62, or α-synuclein was observed by comparison to nTg controls among either Dutch APP or Dutch APP/PS1ΔE9 mice, suggesting that autophagic/lysosomal clearance may be intact at this stage of pathology (figure 3). However, we noted a significant accumulation of insoluble p62 among only Dutch APP/PS1ΔE9 mice by comparison to their nTg and Dutch APP littermates (figure 3, A and C) and this effect was also observed to precede onset of autophagic/lysosomal failure in TgCRND8 mice.19 Based on this result, it is tempting to speculate that the insoluble accumulation of Aβ42 and p62 may represent an early marker of toxicity to the autophagic/lysosomal pathway; however, further aging studies with these mouse lines will be necessary to determine whether autophagic/lysosomal failure occurs at any age. Brain lysates were analyzed for levels of soluble (LC3, p62, α-synuclein) and insoluble (p62) autophagic/lysosomal substrates and APP metabolites (A–E). 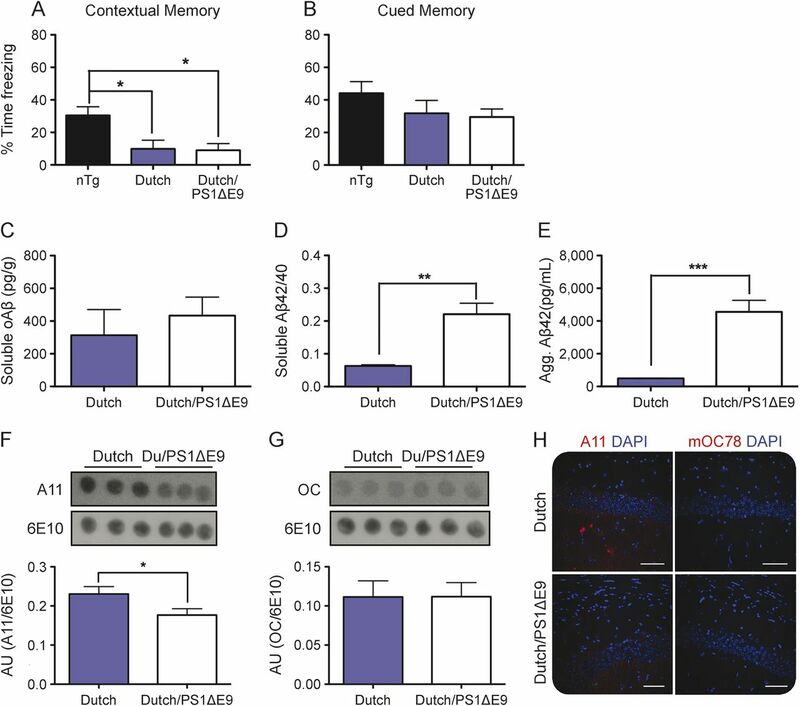 No impairment of autophagic/lysosomal clearance was observed at this age; however, only Dutch/PS1ΔE9 mice accumulated insoluble p62, which we previously reported to occur before autophagic/lysosomal failure in the brains of TgCRND8 mice19. Western blots are representative littermates, histograms represent mean ± SEM; *p < 0.05; 1-way analysis of variance with Bonferroni post hoc analyses. nTg = nontransgenic. Treatment of Dutch mice with IG rescued learning behavior. Next, we sought to determine whether antibodies against various forms of soluble or insoluble Aβ assemblies may be responsible for the benefit provided by IG therapy. We previously reported deficits on hippocampus-dependent memory in the Morris water maze task and FC in the Dutch APP mouse line.12,23 Here, we chose a battery of tasks that target both hippocampus-dependent memory as well as the entorhinal cortex and amygdala to assess complete memory function; these include FC,17,23 NOR,17,23 and Y-maze SA (previously untested), or anxiety-like behaviors using the EPM (previously reported17,23). Three-month treatment of Dutch APP mice by once-weekly subcutaneous injection of neat IG prevented onset of NOR (figure 4A), SA (figure 4B), and FC (figure 4C) deficits, without affecting anxiety-like behavior in the EPM (figure 4D) in female Dutch APP mice. This behavioral protection was completely abrogated by treatment with either saline or fibrillar Aβ-affinity-depleted or total Aβ-affinity-depleted IG. However, a statistically significant benefit in learning behavior tasks (e.g., NOR) was observed among Dutch APP mice treated with oligomer Aβ-affinity-depleted IG (figure 4A). Five-month-old female Dutch APP E693Q transgenic mice were given weekly subcutaneous injections of either saline (n = 11) or 2 g/kg neat Baxter IG (n = 12), 2 g/kg IG depleted of anti-fibril Aβ antibodies (fibril Aβ-affinity-depleted IG; n = 11), 2 g/kg IG depleted of anti-oligomer Aβ antibodies (oligomer Aβ-affinity-depleted IG; n = 11), or 2 g/kg IG depleted of both anti-oligomer and anti-fibril Aβ antibodies (Aβ-affinity-depleted IG; n = 11) for 3 months. Unlike treatment of saline, fibril Aβ-affinity-depleted IG and Aβ-affinity-depleted IG, treatment of IG prevented onset of behavioral deficits in novel object recognition (A), Y-maze spontaneous alternation (B), and contextual/cued fear conditioning (C) without affecting anxiety-like behavior in the elevated plus maze (C) in Dutch APP E693Q transgenic mice. Treatment of oligomer Aβ-affinity-depleted IG prevented onset of behavioral deficit in novel object recognition (A) in Dutch APP E693Q transgenic mice. *p < 0.05; **p < 0.01; 1-way analysis of variance with Bonferroni post hoc analyses. Data expressed as mean ± SEM. Aβ = β-amyloid; IG = Immune Globulin. Treatment of mice with neat IG did not affect brain levels of Aβ40 (figure 5, A–D) or Aβ42 (figure 5, E–H), or its ratio (figure 5, I–L), but rather reduced brain levels of both toxic prefibrillar A11-immunoreactive soAβ (figure 5M) and NU-4-immunoreactive assemblies (figure 5N) in Dutch APP mice. Levels of OC-immunoreactive soluble fibrillar oligomers were not affected following treatment with neat IG in Dutch mice (figure 5O). Treatment of mice with fibrillar Aβ-affinity-depleted IG apparently reduced brain levels of NU-4-immunoreactive (figure 5N) but not A11-immunoreactive (figure 5M) soAβ assemblies in Dutch APP mice. Thus, neat IG treatment was associated with clinical benefit and reduction of 2 immunosubtypes of soAβ assemblies (i.e., both A11-type and NU-4-type oligomers). Among 3 immunoaffinity-depleted IG preparations, only one was clinically effective, and, unexpectedly, that bioactive fraction was the fibrillar Aβ-affinity-depleted IG that was associated with reduction in the content of NU-4-type soAβ assemblies. We cannot determine whether reduction in the content of A11-type soAβ assemblies might also be associated with clinical benefit. The relevance of this point is discussed in detail below. Five-month-old female Dutch APP E693Q transgenic mice were given weekly subcutaneous injections of either saline (n = 11) or 2 g/kg neat Baxter IG (n = 12), 2 g/kg IG depleted of anti-23 fibril Aβ antibodies (fibril Aβ-affinity-depleted IG; n = 11), 2 g/kg IG depleted of anti-oligomer Aβ antibodies (oligomer Aβ-affinity-depleted IG; n = 11), or 2 g/kg IG depleted of both anti-oligomer and anti-fibril Aβ antibodies (Aβ-affinity-depleted IG; n = 11) for 3 months. Aβ40 (A–D), Aβ42 (E–H), or Aβ42/40 ratio (I–L) were unaffected with all treatments. Treatment with IG reduced brain levels of prefibrillar oligomers (M) and oligomers (N) but not fibrillar oligomers (O) in Dutch APP E693Q transgenic mice. Treatment of fibril Aβ-affinity-depleted IG reduced brain levels of oligomers in Dutch APP E693Q transgenic mice (N). (A, E, I) Total Aβ. (B, F, J) TBS fraction. (C, G, H) Triton-X fraction. (D, H, I) Formic acid fraction. (M, N, O) TBS fraction (n = 5/group). *p < 0.0; **p < 0.01; 1-way analysis of variance with Bonferroni post hoc analyses. Data expressed as mean ± SEM. Aβ = β-amyloid; IG = Immune Globulin. Our group recently performed an integrative genomic analysis of the transcriptomes from human AD brain tissue or 2 independent mouse lines (including the Dutch APP mouse line) to identify altered molecules and pathways between wild-type and transgenic mice, and human patients with AD.28 These studies revealed consistent alterations in APP/Aβ metabolism, epigenetic control of neurogenesis, cytoskeletal organization, and extracellular matrix regulation. Comparison of these transcriptomic results with human AD postmortem gene expression data indicated significant similarities in pathway alterations between mouse models and patients with AD. In addition, it has been reported that changes in neuroinflammation-related gene regulation at early stages of AD was not related to neurofibrillary tangles, Aβ plaque burden, total Aβ40 or Aβ42, or membrane-bound fibrillar Aβ, but rather to increased levels of soAβ.29 Taken together, these studies suggest that soAβ assemblies represent a critical driver of early-stage disease processes, leading to cognitive and cellular dysfunction observed at later stages of disease. IVIg contains antibodies against both monomeric and soAβ.32 In vitro studies in N2a neuroblastoma cells have revealed that IVIg can disaggregate Aβ fibrils and promote Aβ removal33 while preventing neurotoxicity-associated soAβ assemblies.5 Similarly, in cultured primary mouse hippocampal neurons, treatment with IVIg has been shown to reduce Aβ fibril formation and reduce Aβ neurotoxicity.8 Many studies, including ours, revealed no detectable reduction in monomeric Aβ. When IVIg was assessed in the 3xTgAD model of AD, an improvement in NOR, reduced immunologic CD4/CD8 blood ratio, reduced interleukin (IL)-5/IL-10 ratio in the cortex together with limited effects on tau but reduced Aβ42/40 ratio and levels of soluble 56-kDA Aβ oligomers were reported.34 Our study is the first to focus on oligomer immunosubtypes post IVIg treatment. In the present study, IG protection was not associated with altered levels of monomeric Aβ40 and Aβ42 levels but rather with decreased levels of some but not all immunosubtypes of soluble prefibrillar oligomeric Aβ assemblies. A11-immunosubtype and/or NU4-immunosubtype soAβ assemblies appear to be the key conformer(s) driving memory failure. This study suggests that IG may contain A11-like and NU-4–like antibodies that confer some protection in the Dutch APP mouse line. An unexpected result of this study is the improvement in NOR in the oligomer Aβ-affinity-depleted IG-treated mice with no change in Aβ biochemistry. One explanation for this result is that the oligomer preparation used for fibrillar and oligomer Aβ affinity depletion of IG may not contain a complete and comprehensive representation of the structurally diverse spectrum of soluble Aβ assemblies. In other words, these 2 affinity-depleted IG fractions designated “oligomeric” or “fibrillar” may represent an oversimplified binary classification. Another possibility is that the nAbs may contain catalytic antibodies that induce changes in the conformations of the soAβ assemblies as part of their therapeutic bioactivity. “Chaperone-like” activity has been reported for other antibodies35,36 such that the antibodies induce changes in the conformation of soAβ assemblies as part of their therapeutic action and/or as a biochemical reaction in IG-treated brain homogenates during assays. We are currently characterizing the chaperone content of our IG fractions in order to assess this possibility properly. Baxter IG has been proposed as a potential treatment for AD, especially at moderate stage and in carriers of APOE ε4 alleles.37 IG contains natural human polyclonal IgG antibodies that recognize conformational neoepitopes expressed on soluble and insoluble Aβ assemblies. 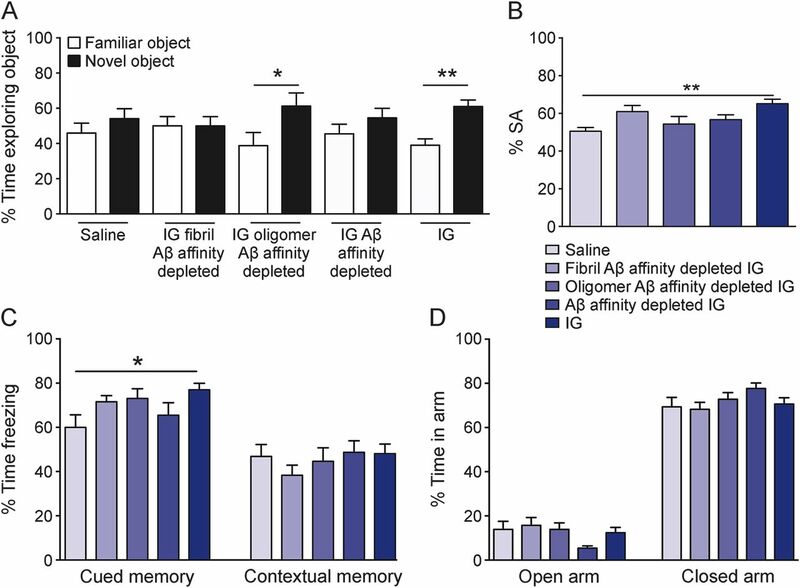 The current study demonstrates for the first time that 3 months of neat IG treatment of Dutch APP transgenic Aβ-oligomer-forming mice is associated with prevention of memory deficits in NOR, SA, and FC that is abrogated by affinity depletion of IG using certain conformers of soluble Aβ assemblies. These principles might well be kept in mind during the continued development and optimization of active and passive anti-Aβ immunotherapies and during the continued early-stage work on creating therapeutic chaperones that have the capacity to stabilize soAβ assemblies in nontoxic conformations. E.M.K. designed the experiments with M.E., P.S., N.R.R., C.M.A., C.G.G., S.G., and J.W.S. E.M.K., S.H.K., J.C.K., A.H., R.A., A.L., A.S., and P.S. performed the experiments. E.M.K. and J.W.S. analyzed the data. E.M.K., P.S., N.R.R., S.G., and J.W.S. wrote the manuscript. This work was supported in part by a grant from Baxter Pharmaceuticals, Inc. J.W.S. is supported by NIH grant K12 GM068524. This work was additionally supported by NIH grants P50 AG05138 (to Mary Sano; S.G.), U01 AG046170 (S.G., M.E. ), R34 AG049649 (S.G.), R01 NS075685 (S.G.), R01 MH065635 (C.M.A. ), R21 AT005510 (S.G.), RF1 AG042965 (S.G.), VA MERIT Review Grant I01 RX000684 (S.G.), the Cure Alzheimer's Fund (S.G.), and gifts from the Louis B. Mayer Foundation, the Sarah and Gideon Gartner Trust, the Rudin Foundation, and the Werber Family Foundation (all to S.G.). E. Knight, S.H. Kim, and J. Kottwitz report no disclosures. A. Hatami is an associate editor for Journal of Alzheimer's Disease, received research support from NIH, Cure Alzheimer's Fund. R. Albay and A. Suzuki report no disclosures. A. Lublin has been employed by Sanofi Genzyme, received research support from University of California, Riverside, holds stock or stock options in Geron and Ionis. C. Alberini is on the editorial board for Neural Plasticity, Neurobiology of Learning and Memory, was on the editorial board for Cell Science, is an associate editor for Frontiers in Neuroscience, received research support from NIH. W.L. Klein served on the scientific advisory board for Acumen Pharmaceuticals, received research support from NIH, Baxter-NU Alliance, NUCATS/Northwestern. P. Szabo reports no disclosures. N. Relkin served on the scientific advisory board for Anavex, Herbal Science Group, Eisai, was an associate editor for Neurology Alert, has patents pending for Multiplexed CSF markers for Alzheimer's disease, Diffusion tensor histogram analysis for diagnosis of hydrocephalus: an analytic method for identifying a DTI pattern associated with normal pressure hydrocephalus, Volumetric MRI for predicting response to IVIg treatment of Alzheimer's disease, Cytokine analysis for predicting response to IVIg treatment of Alzheimer's disease, Systems and methods for automating the retrieval of portioned search results, receives royalties from UpToDate, has consulted for Aisai, Forest, Hydrocephalus Association. M. Ehrlich is on the editorial board for ASN Neuro, received research support from NIH, NYSTEM. C. Glabe served on the editorial board for Journal of Molecular Neurodegeneration, has patents and pending patents for immunotherapy and immunodiagnostics for AD, consults relating to intellectual property, receives license fee and royalty payments for antibodies for research purposes only and patent issues, received research support from NIH, Cure Alzheimer's Fund, was involved in legal proceedings for Sidley LLP. S. Gandy is an associate editor for ADAD, Molecular Neurodegeneration, is a consulting editor for JCI, received research support from Avid/Lilly, Constellation Wines. J. Steele is a scientific advisory board member for OrPhi Therapeutics Inc., was editor-in-chief and consulting editor for Journal of Postdoctoral Research, has a pending patent for Mitoprotection for treatment of lysosomal storage diseases, consulted for Amicus Therapeutics, received research support from CurePSP, DPD Deficiency Foundation, is a cofounder and on the board of directors for OrPhi Therapeutics Inc., holds stock or stock options in Amicus Therapeutics, GlaxoSmithKline. Go to Neurology.org/nn for full disclosure forms. J.W.S. is a cofounder, shareholder, and member of the board of directors and scientific advisory board of OrPhi Therapeutics Inc. (Carlsbad, CA). Within the past 5 years, S.G. has held research grants from Amicus Therapeutics. S.G. is also a member of the Data and Safety Monitoring Board for the Pfizer-Janssen Alzheimer's Immunotherapy Alliance. Accepted in final form April 4, 2016.
. Lifelong management of amyloid-beta metabolism to prevent Alzheimer's disease. N Engl J Med 2012;367:864–866.
. Alzheimer disease: solanezumab—prospects for meaningful interventions in AD? Nat Rev Neurol 2015;11:669–670.
. Immunomodulation and AD: down but not out. J Clin Immunol 2014;34(suppl 1):S70–S73.
. Human antibodies against amyloid beta peptide: a potential treatment for Alzheimer's disease. Ann Neurol 2002;52:253–256.
. Natural human antibodies to amyloid beta peptide. Autoimmun Rev 2008;7:415–420.
. Patients with Alzheimer disease have lower levels of serum anti-amyloid peptide antibodies than healthy elderly individuals. Exp Gerontol 2002;37:943–948.
. Intravenous immunoglobulin for Alzheimer's disease. Clin Exp Immunol 2014;178(suppl 1):27–29.
. Human intravenous immunoglobulin provides protection against Aβ toxicity by multiple mechanisms in a mouse model of Alzheimer's disease. J Neuroinflammation 2010;7:90.
. Effects of human intravenous immunoglobulin on amyloid pathology and neuroinflammation in a mouse model of Alzheimer's disease. J Neuroinflammation 2012;9:105.
. 18-Month study of intravenous immunoglobulin for treatment of mild Alzheimer disease. Neurobiol Aging 2009;30:1728–1736.
. P4-351: effects of uninterrrupted intravenous immunoglobulin treatment of Alzheimer's disease for nine months. Alzheimers Dement 2008;4:T776.
. Days to criterion as an indicator of toxicity associated with human Alzheimer amyloid-beta oligomers. Ann Neurol 2010;68:220–230.
. Globular amyloid beta-peptide oligomer: a homogenous and stable neuropathological protein in Alzheimer's disease. J Neurochem 2005;95:834–847.
. Conformational Abs recognizing a generic amyloid fibril epitope. Proc Natl Acad Sci USA 2002;99:1485–1490.
. Seeding specificity in amyloid growth induced by heterologous fibrils. J Biol Chem 2004;279:17490–17499.
. Measurement of anti-beta amyloid antibodies in human blood. J Neuroimmunol 2010;227:167–174.
. Evidence that small molecule enhancement of beta-hexosaminidase activity corrects the behavioral phenotype in Dutch APP(E693Q) mice through reduction of ganglioside-bound Abeta. Mol Psychiatry 2015;20:109–117.
. High-fat diet-induced memory impairment in triple-transgenic Alzheimer's disease (3xTgAD) mice is independent of changes in amyloid and tau pathology. Neurobiol Aging 2014;35:1821–1832.
. Latrepirdine improves cognition and arrests progression of neuropathology in an Alzheimer's mouse model. Mol Psychiatry 2013;18:889–897.
. Early-onset behavioral and synaptic deficits in a mouse model of Alzheimer's disease. Proc Natl Acad Sci USA 2006;103:5161–5166.
. Spatial navigation testing discriminates two types of amnestic mild cognitive impairment. Behav Brain Res 2009;202:252–259.
. Alzheimer's presenilin 1 modulates sorting of APP and its carboxyl-terminal fragments in cerebral neurons in vivo. J Neurochem 2007;102:619–626.
. Proneurogenic group II mGluR antagonist improves learning and reduces anxiety in Alzheimer Abeta oligomer mouse. Mol Psychiatry 2014;19:1235–1242.
. Fibrillar oligomers nucleate the oligomerization of monomeric amyloid beta but do not seed fibril formation. J Biol Chem 2010;285:6071–6079.
. Soluble fibrillar oligomer levels are elevated in Alzheimer's disease brain and correlate with cognitive dysfunction. Neurobiol Dis 2009;35:352–358.
. Quaternary structure defines a large class of amyloid-beta oligomers neutralized by sequestration. Cell Rep 2015;11:1760–1771.
. Low PiB PET retention in presence of pathologic CSF biomarkers in Arctic APP mutation carriers. Neurology 2012;79:229–236.
. Molecular systems evaluation of oligomerogenic APP and fibrillogenic APP/PSEN1 mouse models identifies shared features with human Alzheimer's brain molecular pathology. Mol Psychiatry Epub 2016 Jan 19.
. Neuroinflammatory signals in Alzheimer disease and APP/PS1 transgenic mice: correlations with plaques, tangles, and oligomeric species. J Neuropathol Exp Neurol 2015;74:319–344.
. Naturally occurring autoantibodies against beta-amyloid: investigating their role in transgenic animal and in vitro models of Alzheimer's disease. J Neurosci 2011;31:5847–5854.
. IVIG immunotherapy protects against synaptic dysfunction in Alzheimer's disease through complement anaphylatoxin C5a-mediated AMPA-CREB-C/EBP signaling pathway. Mol Immunol 2013;56:619–629.
. Antibody concentrations to Abeta1-42 monomer and soluble oligomers in untreated and antibody-antigen-dissociated intravenous immunoglobulin preparations. Int Immunopharmacol 2010;10:115–119.
. Intravenous immunoglobulin enhances the clearance of fibrillar amyloid-beta peptide. J Neurosci Res 2006;84:434–443.
. IVIg protects the 3xTg-AD mouse model of Alzheimer's disease from memory deficit and Abeta pathology. J Neuroinflammation 2014;11:54.
. An N-terminal antibody promotes the transformation of amyloid fibrils into oligomers and enhances the neurotoxicity of amyloid-beta: the dust-raising effect. J Neuroinflammation 2015;12:153.
. Disaggregation of Alzheimer beta-amyloid by site-directed mAb. Proc Natl Acad Sci USA 1997;94:4109–4112.
. Clinical trials of intravenous immunoglobulin for Alzheimer's disease. J Clin Immunol 2014;34(suppl 1):S74–S79.
. 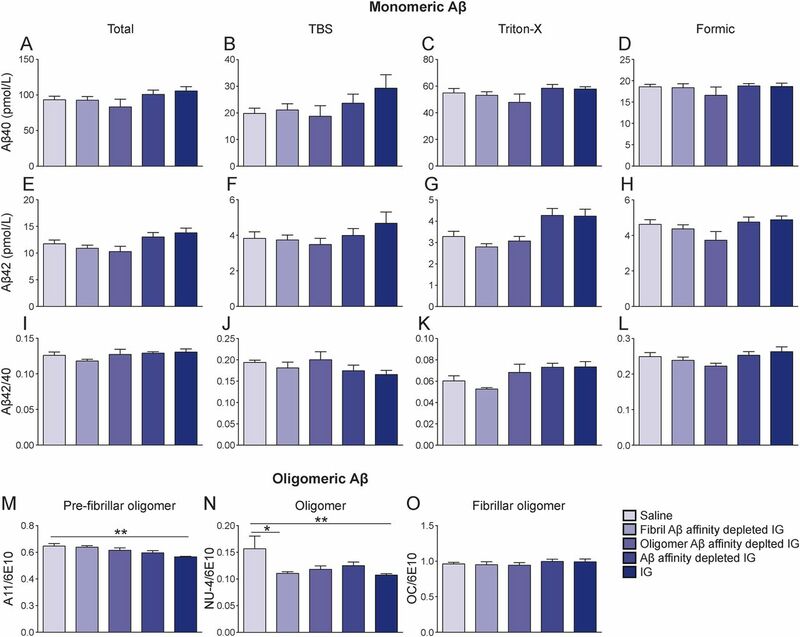 Monoclonal antibodies against Abeta42 fibrils distinguish multiple aggregation state polymorphisms in vitro and in Alzheimer disease brain. J Biol Chem 2014;289:32131–32143.
. Monoclonal antibodies that target pathological assemblies of Abeta. J Neurochem 2007;100:23–35.
. Common structure of soluble amyloid oligomers implies common mechanism of pathogenesis. Science 2003;300:486–489.